1954 US Women | The most courageous display of golf in history. 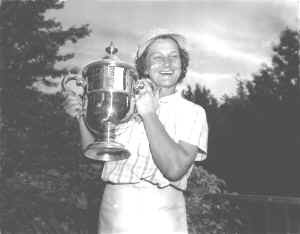 When writing about Babe Didrickson Zaharias's 1954 US Women's Open its easy to cover her wire to wire lead, her 12 stroke margin of victory (a record at the time), her being 43 years old and even the fact that it was her 3rd victory in US Open Women's Championships in only 5 entries. It's even fun to note that Babe was followed by 1000's each day, that she would often talk to the crowd before and after shots, that Golf World described her play as "the greatest sustained golf ever in a women's championship", and that after every perfect tee shot you could hear from the back of the gallery the "hoarse war cry" from her beloved husband George. What's not so easy to write about is that 15 months prior she had major surgery, was wearing a colostomy bag and fighting cancer. After the awards ceremony at the 18th green her message was simple, "My prayers have been answered. I wanted to show thousands of cancer sufferers that the operation I had, a colostomy, will enable a person to return to normal life. I've received 15,000 inquiries from those who have undergone the operation. This is my answer to them." The Babe's simple message of hope brought the already emotional crowd to tears. In 1954, that little "Ladies Tournament" at the Salem Country Club placed the US Women's Open firmly on the list of American Golf's most important. Boston Globe June 27, 1954 "Betsy Rawls Defends Open Title in Great Salem Show" "Greater Boston's biggest and most colorful golfing show of the 1954 season. The event is the United States Golf Association's Women's Open Championship." "In addition to the title defender the LPGA perennial stars Patty Berg, Jackie Pung, Louise Suggs, Betty MacKinnon, along with the glamour sisters Mariere Bauer, Alice Bauer Hagge and up and coming Joyce Ziske The tournament also attracted top amateurs including Mary Faulk and the great Glenna Collett Vare." ".....also in the field at Salem the incomparable Mrs. Zaharias is certain to be a principal magnet for the large galleries......(Mrs. Zaharias) has been a tremendous favorite in these parts since that day long ago she played an exhibition match at Woodland.....Of course the Babe's popularity with golf fans everywhere grew in warmth and intensity since her come back following an operation for cancer more than a year ago." A little digging into that "exhibition match" held on the sacred fairways on Woodland Golf Club reveals that it was more than her golfing skills that made her a Boston sports fan favorite. One can only imagine what that 9 hole practice round was like. Babe loved a her galleries and her galleries loved her. How many jokes were cracked, smiles made, pictures taken ? How many shots did she call ? She and her fans loved her calling her shots, in a practice round, in front of an adoring crowd she'd been thinking about for over a year, man they must have had some fun. "Bend it around the tree, bounce over the trap and check it up 2 feet below the hole.....It didn't matter if the called shots worked out or not, as surely it was just plain fun. Boston Globe July 1, 1954 "Babe Zaharias and Claire Doran fire opening rounds of 72 setting a new women's course record for Salem CC"
"Man, I don't know when I've felt this good" said the Babe. Her exuberance quite understandable to the crowd who watched this terrific performance. Clearly this was Babe's day as the "gallant lady" staged her triumph come back from cancer surgery with booming drives, pin point iron play and steady putting. New York Times July 2, 1954 "Mrs. Zaharias Takes 7-Stroke Lead at Halfway Mark in U. S. Open Golf Former Champion Cards 71 for 143 Mrs. Zaharias Sets a Course Mark Pacing U.S. Open"
"Mrs. Mildred (Babe) Didrikson Zaharias.....With a one-under-par round of 71 that established a women's competitive record for the Salem Country Club, the former title-holder gained a seven stroke lead as she turned in a 36-hole total of 143." ( A 36 hole women's course record as well.) After playing the first nine in at a ho-hum one over 37 Babe blazed through the 2nd nine with a 2 under par 34, thrilling the gallery with birdies on 12 and 15. And if that wasn't enough she blasted her drive on 18 at least 275 yards as if to put an exclamation point on her round and let everyone know she was ready for the 36 hole final day. Starting out the final day Babe had a 7 stroke lead with 36 holes to play and although no one questioned that the size of the lead should hold up, what was being whispered about was would Babe be able to finish. Most US Open golf courses are described as "demanding" and "brutal", earlier in the week after the first few practice rounds the course was described as "...the handsome and rugged Salem course which is stretched to almost 6400 yards..." Betsy Rawls kept it simple in her description of the famed Salem layout "...this is obviously a very tough course." Mrs. Zaharias herself stated "There is no let up." The weather forecast called for sun and temperatures in the mid-eighties, great golfing weather if you're taking a golf car or playing a Sunday afternoon round with friends or family. If you had cancer surgery 15 months prior and are about to tee it up for 36 holes with the US Open on the line the forecast might have been a little daunting. But this was Babe's time and although the thermometers did hit the mid-eighties there was a constant cooling breeze that started early and lasted the day. Boston Globe July 3, 1954 "Babe Wins Golf Title by 12 Strokes, First Ever to Capture Three National Crowns"
"And no writer could have given it the flourish that the gallant and remarkable lady from Texas did herself as she ran off with the women's national Open championship on the Salem Country Club course." From praying in a hospital bed to winning the US Open 15 months later "The cup itself was a symbol of success in Babe Didirkson Zaharias' greatest fight.." Her eyes on the '54 Open in Salem Massachusetts from the moment they opened after her surgery. "This was an answer to my prayer, I said please make me able to play again. I'll take care of the winning" The Babe wet eyed said after her victory. "Today we sealed the bargain." And seal the bargain they did. After setting course records her first two days of open play Babe not only kept control of her 7 stroke lead but with a morning round of one over par 73 increased the lead to the point where she was almost un-catch able. After a brief rest Babe poured it on as only Babe could with a front 9 even par 36, topping her morning front side and her Friday's record setting front nine as well. Running on adrenalin as only the great ones can, Babe hammers her drive on 10 leaving only a wedge to the green which she then proceeded to almost slam dunk for an eagle leaving herself a tap in birdie and the gallery on the edge of out and out frenzy. Four pars and a bogey later Babe found herself on the 16th tee even par, with an overwhelming lead and in a state of rapidly setting in exhaustion. This combination would produce perhaps the most heart wrenching finish in the history of golf. The pace of her walk off the tee had slowed dramatically, even the most casual observer knew fatigue had hit and hit hard. But a bogie on 16 and another on 17 were more than sufficient. One hole to go, a 375 yard par 4 would prove to be a hole "for the golfing ages." Addressing the ball Babe then took the club back and just one more time....God no !..and sent in rocketing into the trees on the right hand side of the fairway, but the crowd instead giving up the customary groan for shots like that, burst in a applause ! An applause that grew louder and stronger with each step, lasting until Babe addressed her second shot. And continuing with each shot as she made her way up the fairway. "Threading the needle" as only the great can, Mrs. Zaharias hit a perfect pitch out leaving her herself an easy wedge to the 18th green which she hit safely on the green about 18 feet past the hole. After taking a little more time than normal to line up her putt ( a little rest perhaps ) , gave it a go and as it just slid by she raised her left leg and twisted giving it her classic body English. Without hesitation she tapped in what was left. The gallery exploded with a two minute ovation that could be heard miles away in downtown Peabody. The new standard for golfing courage and greatness had been set. 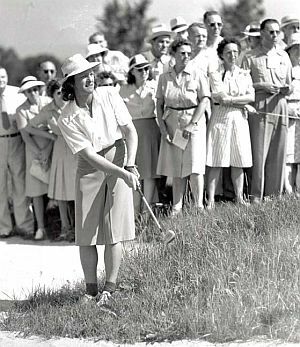 12 stroke margin of victory, US Women's Open, 15 months from cancer surgery, wearing a colostomy bag, Babe Zaharias without a doubt the "Queen of Golf." At the time, the 1954 US Women's Open Championship was called greatest women's golf tournament ever played. 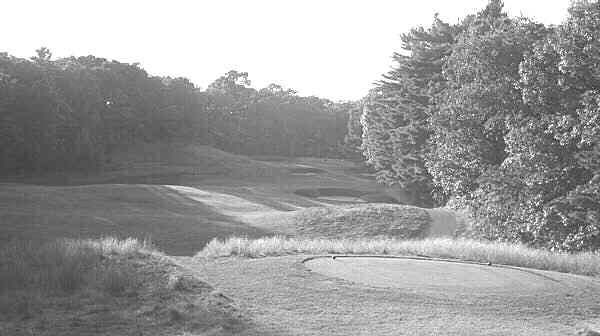 As fate would have it 30 years later in 1984 the US Women's Open Championship would return to Salem Country Club. Without getting into how the press and media golf world treated this, let's read what 1984 Champion Hollis Stacey had to say about winning at Salem "..one of the greatest achievements in my playing career." Surrounding the 1954 Women's Open there was a lot of speculation about what would happen to the LPGA Tour when Babe was no longer playing. As only the Golf God's could arrange on the final day of Open play Babe was paired with a 19 year old amateur from San Diego by the name of Mary Wright. Mary "Mickey" Wright would go on to win 82 LPGA tournaments, providing the LPGA with all the star power they would need to establish the firm foothold they have today.